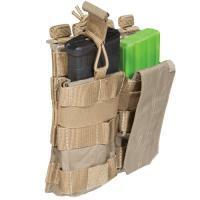 Reload firearms with silent efficiency using the 5.11 Tactical Double AR Bungee Cover Magazine Pouch. Engineered for tactical use, this mag pouch offers both standard flap and bungee retention options for secure and noiseless magazine access. Integrated internal elastic straps provide magazine compression to prevent noisy rattles. A lightweight ultra-durable 500D nylon construction offers a sturdy base that will not rip or tear, while bartacked stress points and Duraflex™ hardware provide additional support and strength. Built to stand up to any environment, a soil and water-repellent coating protects magazines from the elements and non-slip tabs guarantee dependable access in wet and icy conditions. MOLLE and 5.11 SlickStick™ compatible webbing allows for convenient and versatile attachment options. Bungee cord and flap cover retention offer silent magazine access. Dimension (H x L x W): 6.25" x 6" x 1.75"